The Art of Resistance, a popular and powerful collection of new art, has a closing reception First Friday, March 3, 2017, 5-8 PM. Location: Backstreet Gallery down Art Alley, behind 312 South A Street, in the SOFA Arts District, Santa Rosa. Park on South A Street and follow the red signs. The Art of Resistance offers completely new work created by professional artists since the last presidential election. Intelligent, passionate, and expert, it is not typical political art. Over 30 Sonoma County artists have created disturbing and beautiful works of art. Join us for this powerful show by your local arts community. Created and curated by Suzanne Edminster. Read below for excerpts from articles by the Press Democrat and North Bay Bohemian. ‘The Art of Resistance’ shows through March 3 at Backstreet Gallery, in the art alley behind 312 South A St., Santa Rosa. Open by appointment. 707.568.4204. ‘We Shall Overcome’ opens with a reception on Saturday, Feb. 18, at Calabi Gallery, 456 10th St., Santa Rosa. 4–7pm. 707.781.7070. If there’s one upside to Donald Trump, it’s that he has spurred local artists to pick up their paintbrushes and pencils. 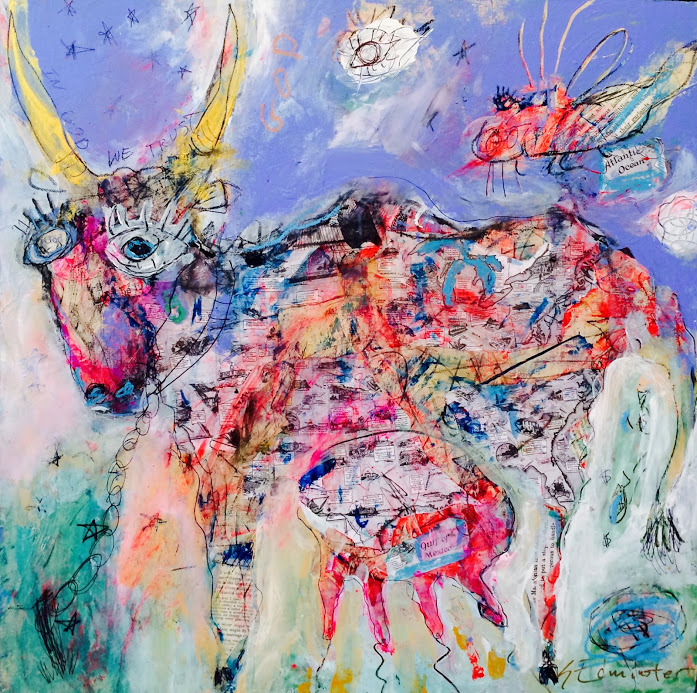 Edminster is an abstract acrylic painter and monotype printmaker whose Saltworkstudio is located in Backstreet Gallery in the SOFA arts district of Santa Rosa. She says Trump’s campaign of lies and capture of the White House has become a cultural climate change as deadly as rising sea levels. Edminster and dozens of other artists in the North Bay rallied to produce new works of accessible, progressive and politically minded art. Edminster called upon more than 30 local artists to create new works on display at Backstreet Gallery’s “The Art of Resistance,” showing on Saturdays and by appointment through March 3. “I thought we need some honest reactions,” she says. When she put the call out for political art, she wasn’t sure what would come in and she says the majority of pieces are not your typical political art. That doesn’t mean the works in the exhibit are all flower-power images of peace and love. Some take a dark look into the hearts of those who refuse to help refugees, though many of the pieces try to find the light in the moment of darkness. Edminster’s contribution to the show is Cash Cow, which tells the story of America’s corporate takeover through arresting visuals. A map of America is overlaid with splatters of color, and a striking image of a cow being led by a chain around its neck to depict the ways that America is being milked for all she’s worth. Read more. If the mission of artists is to reflect and respond to the world around them, then how can they ignore the dominant current event in American life — the unexpected rise and election of Donald J. Trump as president of the United States? By contrast, the “Art of Resistance” show is at least as whimsical as it is strident. 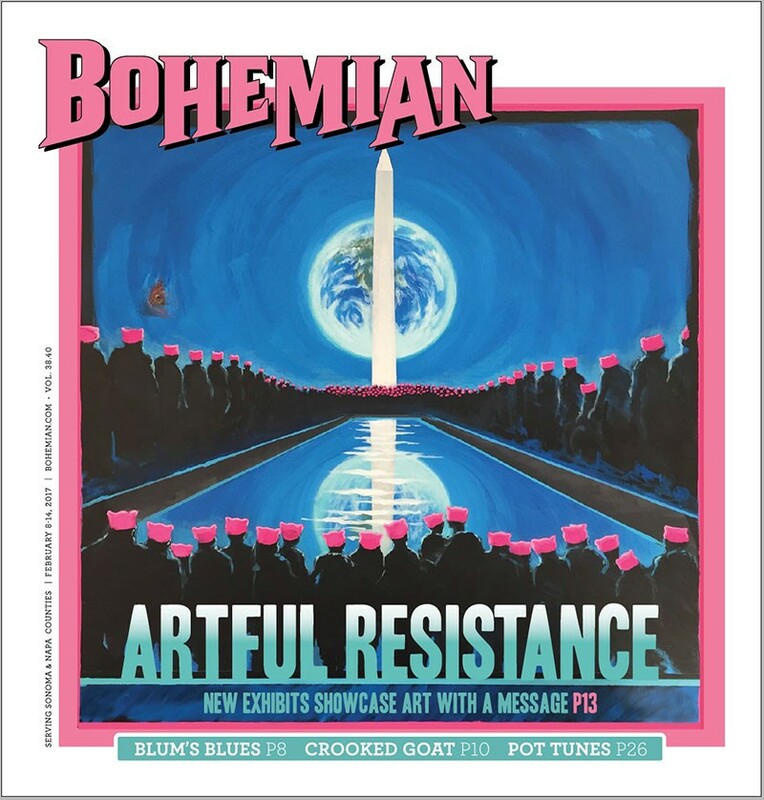 Graton artist Tony Spiers, who integrates pop culture icons into his work, drew a picture of Batman wearing one of the pink knit “pussycat” hats seen in the Women’s March.